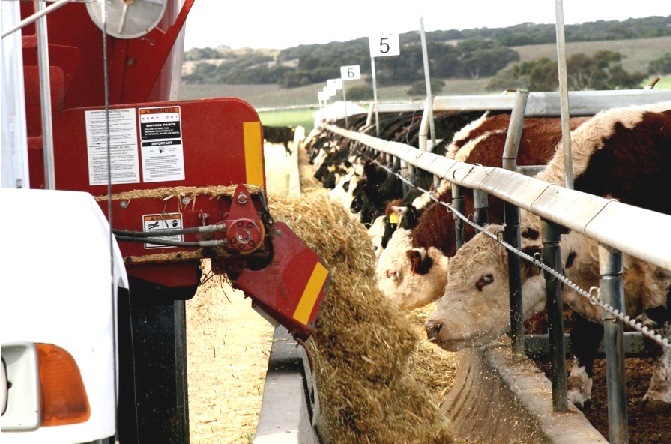 CATTLE numbers on feed could drop about 10 percent to around one million head this year from the record levels reached in 2018, Meat & Livestock Australia’s 2019 beef industry projections released today suggests. 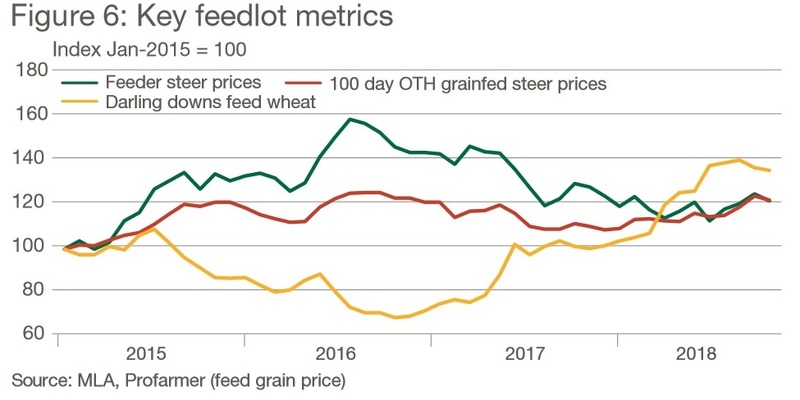 Lotfeeders face similar feed cost pressures to last year, but remain incentivised by strong international demand for grainfed product and a lack of alternatives for finishing cattle in the current drought conditions across eastern Australia. 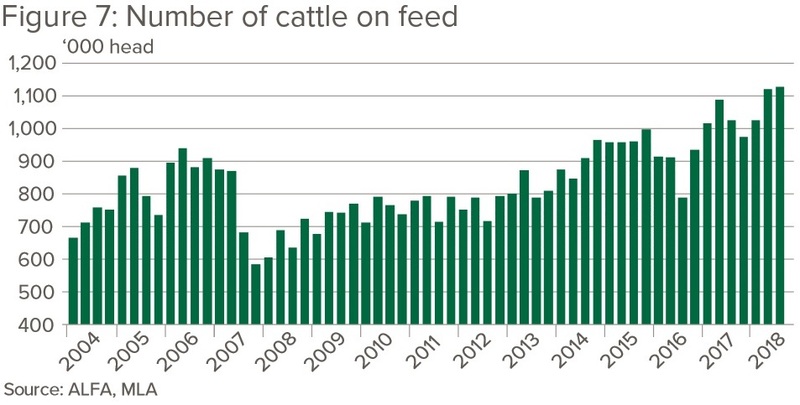 Cattle on feed reached record numbers during 2018, despite the high cost of grain. Given the recent difficulty in finishing cattle on grass, the nation’s feedlots continue to play a crucial role in mitigating production variability, MLA’s report said. While a reasonable sorghum harvest will go some way to alleviating the supply shortage of feedgrain, preferred feedlot grains such as barley and wheat will likely remain expensive for the foreseeable future. “For this reason, lotfeeders will closely monitor the development of the winter cereal cropping season in 2019,” the report said. “Rain could potentially provide some relief as crops are harvested, but would likely mean a sharp short-term increase in the price of feeder cattle. Lotfeeders, like the rest of industry, will be hoping for rain, but it is unlikely to provide any short-term margin relief,” it said. Factoring in solid international demand and a lack of finishing alternatives, cattle on feed will likely remain historically high throughout 2019, but revert to levels closer to one million head, the Projections report said. Rising consumption of high quality grainfed beef in key export markets saw slightly more stable prices for feeder cattle last year when compared to the wider store market. Feeder steers fell 5 percent over the year to close at 291¢/kg live weight, but remained 11pc above the five-year average. Although 2018 was a poor year overall for the young cattle market, promising price movements at different stages alluded to underlying producer intentions. On the back of decent, albeit fairly isolated rainfall events in March and October, the EYCI lifted rapidly. Looking ahead, weather will most likely have the strongest impact on domestic and young cattle prices. However, exchange rates, US and South American production, market access developments and Chinese demand will all play an important part. The major concern for the industry is the scenario in which conditions do not improve during the southern autumn and coming into winter. This would likely result in further destocking and downward pressure on prices, particularly for store-conditioned cattle. “Unfortunately, this scenario is becoming more probable as the year progresses,” Projections said. “A reversal of current conditions would require far more sustained rainfall than the occasional showers and storms that have thus far defined the summer. Finished cattle will likely remain supported, given the fact that demand fundamentals remain strong, and supply of quality slaughter cattle will remain tight. As pastures are yet to establish in most regions, and an immediate alleviation in high grain prices is not expected, heavy cattle could potentially remain undersupplied well into 2019,” it said. National adult carcase weights are estimated to have fallen 6.2kg to 291kg/head in 2018, underpinned by a lack of pasture and high percentage of female slaughter. This tended to over-ride the additional carcase weight contribution from record cattle numbers on feed. Despite the decline in average carcase weights, 2018 carcase weights were still the second highest on record, supported by historically high numbers on feed propping up male weights. Genetic improvements and better management techniques have also had an impact, as average carcase weights have typically increased by 2kg/year over the last 30 years. In 2019, average adult carcase weights are expected to come back further, to 289kg, as female slaughter remains high and seasonal conditions remain sub-optimal. Female carcase weights are predicted to remain fairly stable, at around 256kg, while male carcase weights are likely to decline as pasture conditions remain poor and cattle on feed decline and enter at lower weights. As a result of reduced slaughter and lower carcase weights, total beef production is forecast to decline 4pc, to 2.2 million tonnes carcase weight this year. However, this could fall further if above-average rainfall occurs over a widespread area, lowering the percentage of female cattle slaughtered, albeit an increase in finished carcase weights would help offset some of the decline. Click here to access MLA’s 2019 beef industry projections.